If you are in IT, sooner or later you are going to need to convert some technology, , , install new hardware and software to replace some old equipment and software, or maybe install new equipment and software for a totally new application. The tool I’m sharing with you in this article is a Systems Conversion Project Schedule. In most system conversions or new system installations, there are a few key groups of tasks required to do the job. Something that can help organize your project schedule is to group the detail tasks by category. Assessment – Identifying everything required to complete the project. Order and organize – Ordering equipment, software and other items as needed plus organizing components of the project. Infrastructure – Infrastructure and desktop support tasks. Setup/Installation – Software installations, etc. File build tasks would also be in this category. Programming – Programming and Business Analyst work. Training – Training and testing tasks. You may need other category groups depending upon the nature of your project. Most system conversion or installation projects will have at least the six I’ve listed above. Organizing the tasks by category group will also help you when you run weekly status meetings to determine the status of the project as it organizes the discussion into logical work groupings. What I like to do for each task is to put a “/” in the cell for the week the task needs to be completed by. When the task is completed, I change the slash (/) to an “X”. This way, it is very easy to walk through a status meeting quickly by just focusing on this week’s tasks that have not been marked as completed. It also makes it easy to visually see the status of the project. Another thing to consider for your project is that there will be tasks that are critical to the project, , , in fact they may be bottlenecks that can jeopardize a successful delivery of the project. It’s easy to highlight these tasks for the team by shading the cell that shows the scheduled completion date for the task. By doing this, it will trigger you to ask about the status of the task weeks in advance of its scheduled completion date to instill a sense of urgency on whoever has responsibility for the task. Project success is much more likely when you organize your project into a solid schedule, assign appropriate responsibility, and check on the status every week. In the sample there is a generic project schedule along with an actual project schedule sample used for a past systems conversion. Feel free to use these to help you in your next systems conversion or installation. 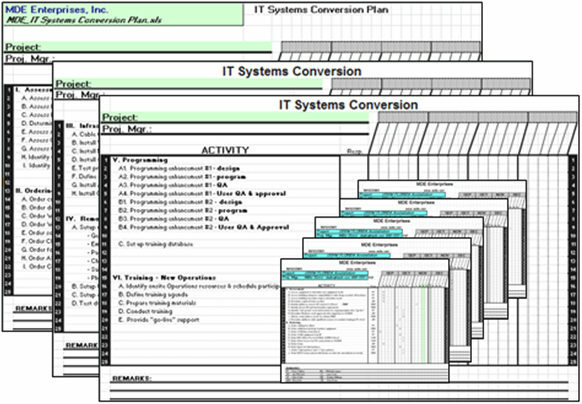 CLICK HERE to download the customizable Systems Conversion Project Schedule template. This entry was posted in IT Manager Tools and tagged project plan, project planning, project planning template, project schedule, project schedule for conversion, systems conversion project schedule. Bookmark the permalink.